9 May 2018. 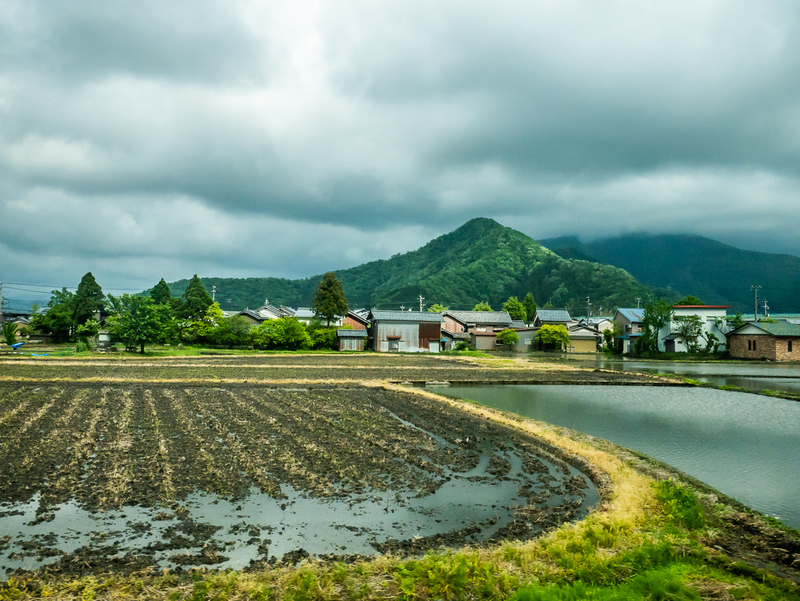 In the grey early morning I wait outside the hostel in Shirakawa Village. I have a bus to catch. My bags are all packed and I wait with them beside me, vaguely anxious about whether or not my ride to the bus stop will show up on time. Of course it does. This is Japan. People are reliable and punctual. After my peaceful sojourn in Shirakawa-gō I take the bus back to Kanazawa Station. After a one and a half hour journey I step down from the bus and she is there. I recognise her immediately. Finally I get to meet Mo in person. We have been following each other’s blogs for many years now and meeting in person is as sweet as I could have imagined. Conversation is immediate and easy. We walk and talk from the bus to the luggage lockers inside the station where I leave all the heaviest baggage. We walk and talk from the station all the way to the famous Kenrokuen Garden. On the way we pass a row of huge trees, perfectly shaped. The branches are propped up with wooden poles to help them bear the weight of the winter snows, and thus retain their perfect shape. It is the Japanese way, this love of, and caring for, nature. Arriving at the garden we continue to walk and talk until we get to a teahouse by the lake. By now we are both in need of refreshment. 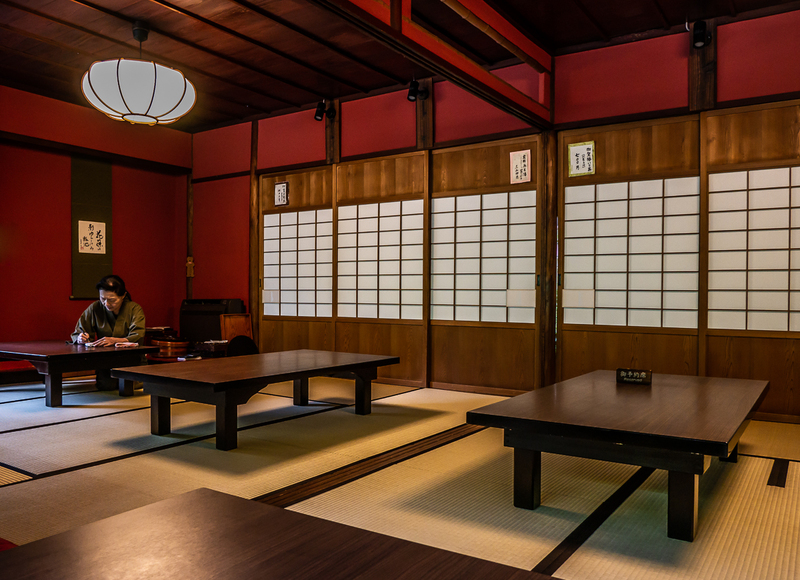 There are many traditional teahouses in Kenrokuen Garden. I probably would not have gone into any of them – I wouldn’t know what to order, or whether they would have something I would want, or if the menu would be only in Japanese, or how to behave properly. Japanese teahouses are so serene and peaceful that I feel like a bumbling foreigner. Sometimes I’m really not a very brave traveller. And besides I was hanging out for a coffee and cookie, but clearly neither was going to be available. But Mo! Mo has lived in Kanazawa for a couple of years now, teaching English. She knows what to do. So we take our shoes off, enter, and sit on the tatami mat at a table by the window. Mo looks at the menu, and we decide on matcha green tea. 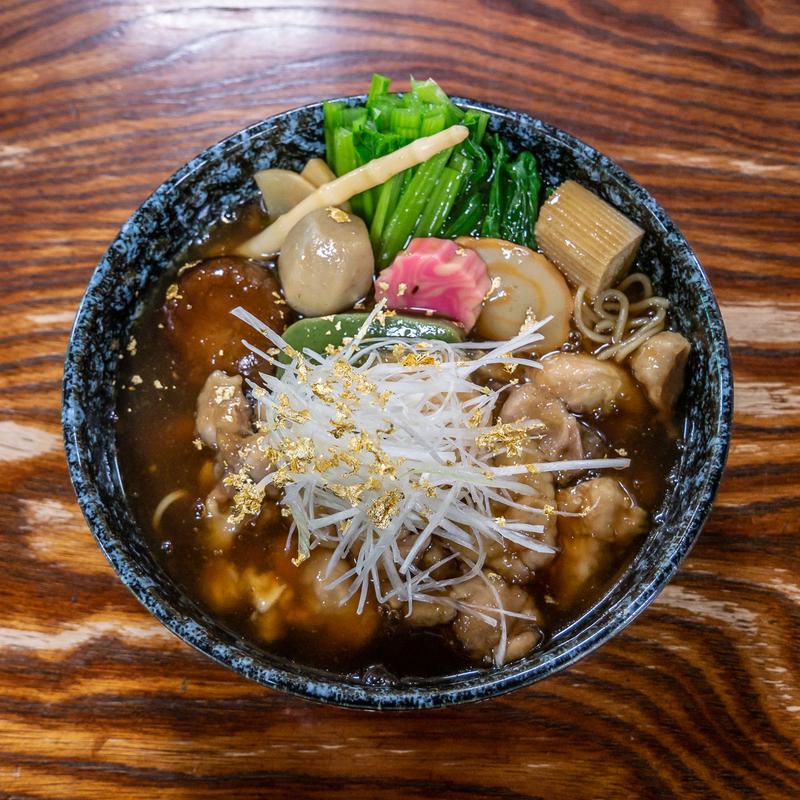 It is served in a bowl and comes with a sweet treat, Japanese-style. The little cake has a kanji stamped into the (pressed rice) mochi on the outside. Or perhaps it is not kanji but a rendering of the Kotojitoro Lantern, one of the emblems of Kenrokuen. The cakes, called daifuku, have sweet red bean paste in the middle. It is all so simple, so perfect, so elegant. We savour it slowly, gazing out the window at the lake, and talking more, about life, about blogging, about adventures. Of course I am as refreshed by the tea and red bean cake as I would have been by coffee and a cookie. When we are done we set out to explore the garden, although it is far from Mo’s first visit. 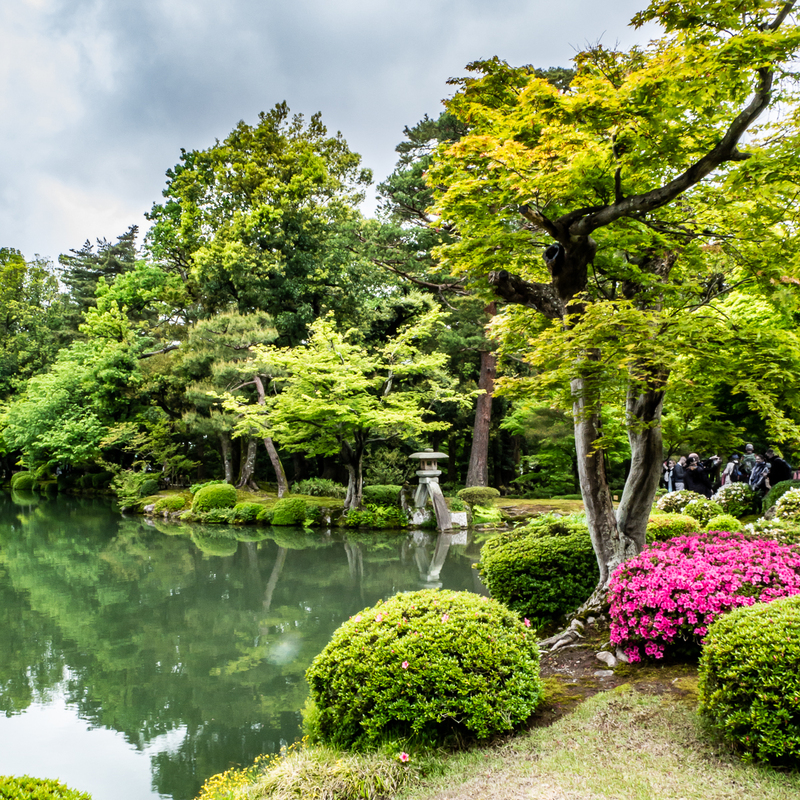 Kenrokuen Garden is considered one of the three most beautiful landscape gardens in Japan together with Mito’s Kairakuen and Okayama’s Korakuen. 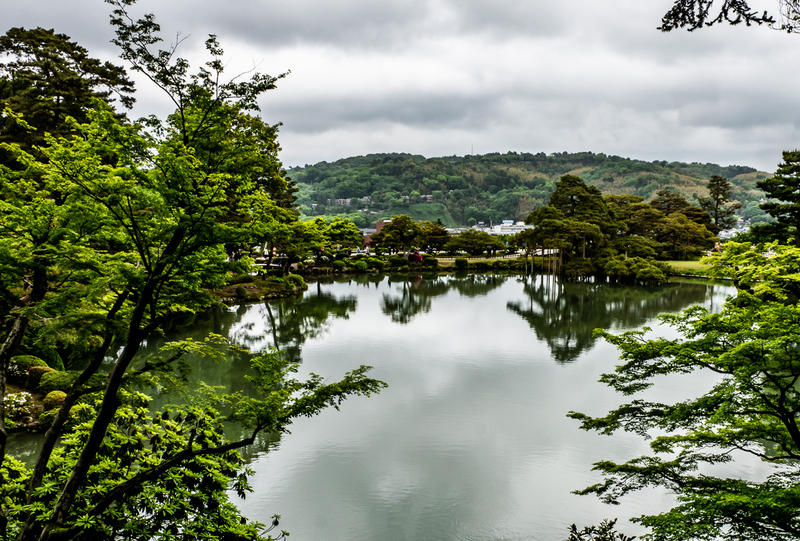 Kenrokuen, the outer garden of Kanazawa Castle, was founded and extended by the ruling Maeda family over nearly two centuries during the Edo period (1603 – 1868) and is typical of the gardens of the feudal lords of the time. It was opened to the public in 1871. According to the ancient Chinese book of gardens, there should be six different sublime qualities to which a garden can aspire. Grouped in their traditional complementary pairs, they are spaciousness and seclusion, artifice and antiquity, water-courses and panoramas. As might be imagined, it is difficult enough to find a garden that is blessed with any three or four of these desirable attributes, let alone five, or even more rarely, all six. Yet that is just the case here, where as the name “Kenroku-en” literally means “garden that combines six characteristics”. and many hidden secret nooks. We find curved stone bridges, moss-covered rocks, and paths bordered by bamboo fences. Designed as a strolling garden it is an organic combination of nature allowed to run free and careful tending to create perfection. 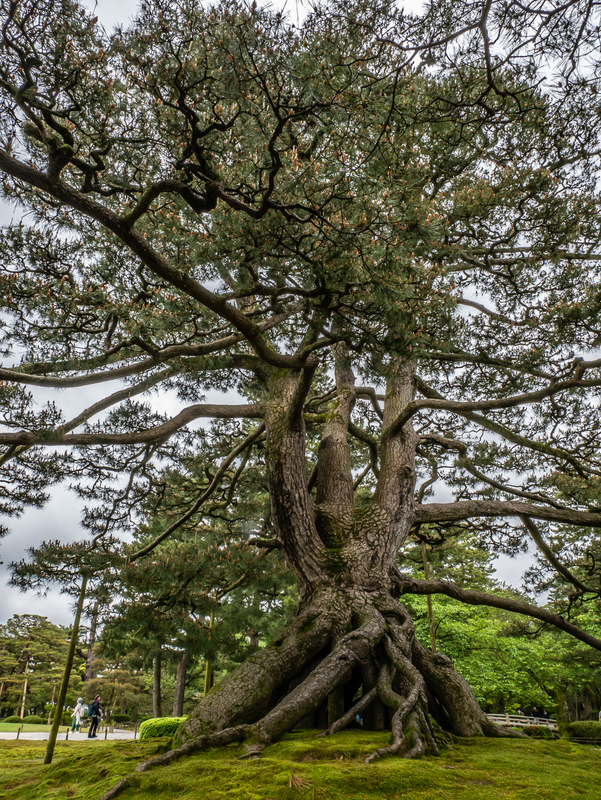 There seems to be hidden beauty everywhere we turn but perhaps the real secret of Kenrokuen is that it was based on the concept that gardening is about consistently creating eternal life. 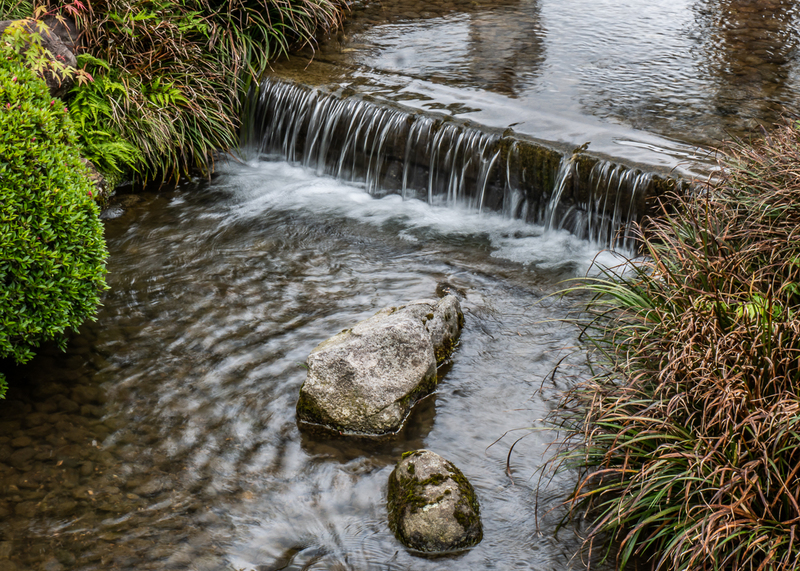 Thus a large pond was created to resemble an ocean, with an island where lived a legendary wizard. The wizard apparently had the secret to perpetual youth. Thus was the craving for eternal life of the feudal lords built right into the garden. They may not have achieved eternal life, but perhaps their garden is on its way. Just outside the garden’s paid area there is a pedestrian way lined with cherry trees, shops, and restaurants. It’s lunchtime. I suppose if I’d been alone I’d have walked along this street and chosen a restaurant at random, walked shyly in, and made a stab at ordering something. But I’m following Mo. She chooses a restaurant, at random, and we seat ourselves in the back. It’s nothing special: a homey place selling souvenirs at tables in the front. Oh but the meal! Japanese food is from heaven. I choose chicken ramen but it is so much more than that. I think it is the best ramen I have in Japan, the best ramen I have anywhere ever. It has mushrooms and greens, corn and jellied vegetables, white asparagus, and a broth made in paradise. It is one of the most delicious meals I’ve ever had. And the crowning glory is that it has gold flakes sprinkled on top. That gives me pause. Do I really want to ingest metal? Whatever. I dive right in and it’s as if the ramen is swallowing me. I can’t not eat it it’s so good. And the gold flakes? It is a Kanazawa tradition, and they are of course quite edible. The production of gold leaf in Kanazawa dates back to the 16th century. 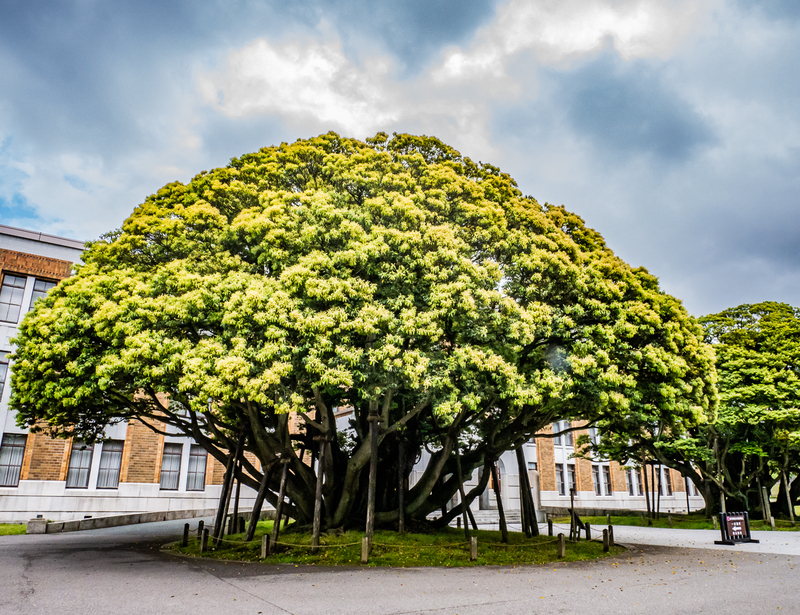 Kanazawa had the gold, and the ideal climate for the production of gold leaf. Even today it produces 98% of the gold leaf in Japan. Because gold leaf was thought to contribute to perpetual youth and longevity it was, and still is, used to decorate food. I have no idea what they do to make it edible, but you can buy soft ice cream and other confections with a piece of gold leaf draped over it. Of course it’s also used to decorate many things: from folding screens to Buddhist and Shinto altars to Noh costumes and ceramics. My only problem with the ramen is that I can’t finish it all and I can’t take it with me. I hate to leave it but I have no choice. It’s time to go. Mo has a class to teach and I have a train to catch. Thank God I think to ask Mo if she remembers where I’d left my bags. There are hundreds of lockers in Kanazawa Station and I was so busy talking that I didn’t pay attention. I realise I have absolutely no idea where my bags are, but fortunately she is able to point me at least in the right direction. What a sweet easy time we had. How great to finally meet in person. Blogging has brought me so many online friends, and every now and then the connection can take form in real life. It’s rare, but always good. Thanks Mo. It’s an easy journey to Kyoto, a little over two hours. 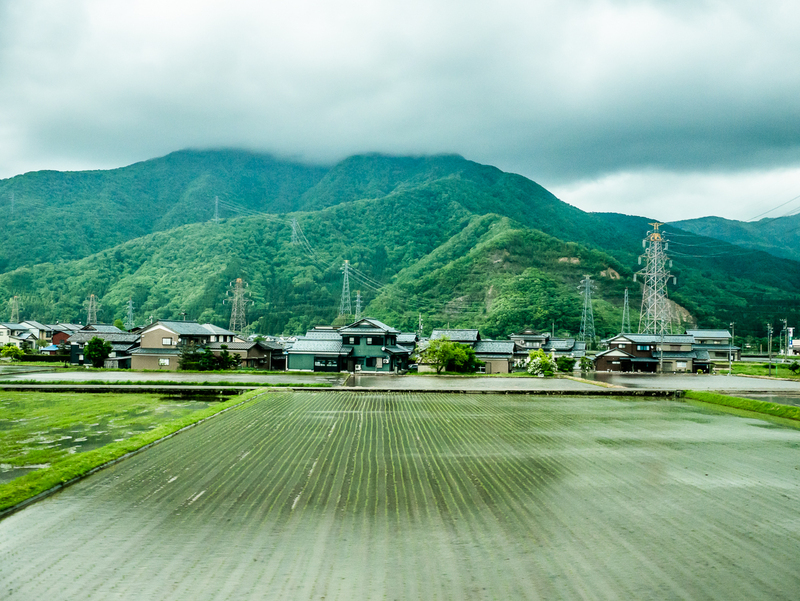 For most of the time I gaze out the window at rural Japan flowing by. 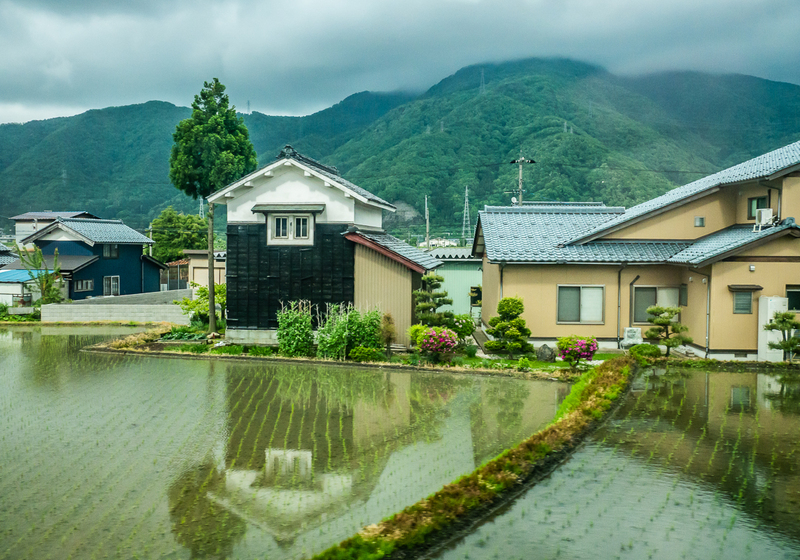 There are rice fields in every last square inch of available land, right up to the houses, and kitchen gardens anywhere there’s not enough room for a rice field. And it is all a rich glorious shrieking springtime green. Go check out Mo’s excellent blog A Stranger in Paradise. Next posts: Six days in Kyoto – shrines and temples, bamboo forests and kimono forests, monkeys, geishas, and markets. I love this story!! And as always, your photographs are stunning. Thanks so much Lieve. Kenrokuen is very special. We’ve had so much fun meeting IRL people we’ve become friends with online. It doesn’t happen often because most, like me and Don, are all over the world and often on the move. Have a wonderful time with your friend in Chiang Mai! Love the photos and narrative! The first photo is stunning, and I especially like all the reflections. Thanks so much Cindy. It’s such a beautiful place I could barely put my camera down. Everywhere I looked there was something else to shoot. Fortunately Mo had her camera with her too. Thanks so much Michelle. That garden is so special! As you say – serene and peaceful. I can imagine going there, mostly alone, in all seasons, and just wandering and photographing. It’s huge. I only saw a small portion of it. The ramen was to die for! Alison, this is another one of those posts that makes me wish I was in Hong Kong to show you around! An ex-coworker of mine here in Indonesia was lucky enough to visit Kanazawa one winter when Kenrokuen was blanketed in snow. His pictures were straight out of a Japanese woodblock print or period drama. 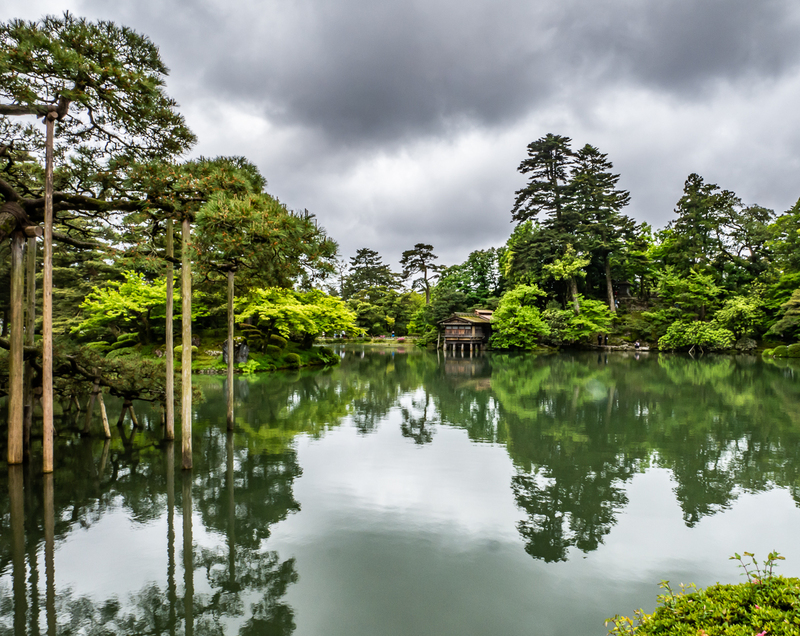 Your own photos, with the riot of comforting greens and dramatic grey clouds, have me wanting to book another trip to Japan, especially since Bama and I were in one of the other two great gardens (Korakuen in Okayama) two years ago. Propping up branches so the trees maintain their perfect shapes is such a Japanese thing to do – I only wish more countries had the same enlightened attitude to nature. 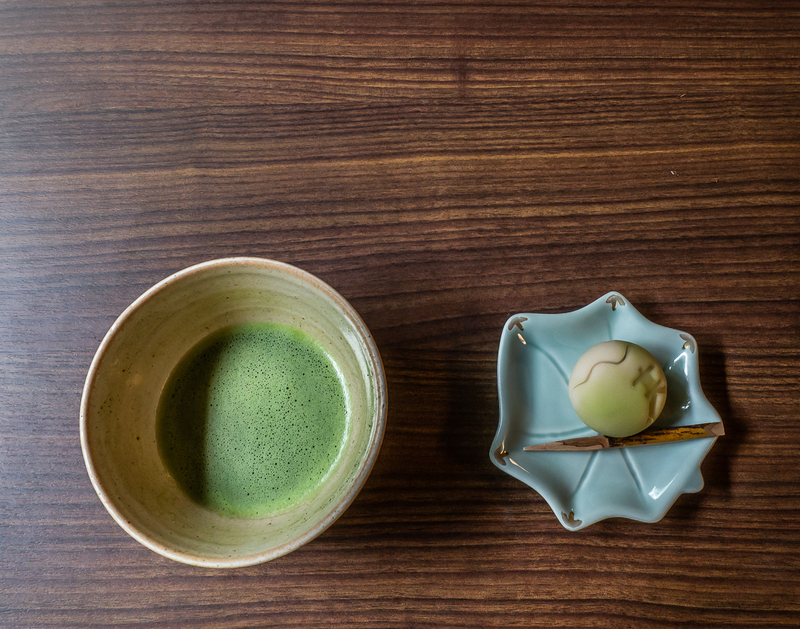 The matcha green tea and exquisite red bean daifuku sound like perfection. And your description of the chicken ramen was so satisfying in its own way; I’d have no qualms eating the gold leaf, even if it were on ice cream! Oh I so wished you were still in HK when I was there! There is nothing like having a local to show you around! Nothing! But I still had a good time 🙂 I love HK. I’d love to see Kenrokuen blanketed in snow. I can imagine how beautiful that would be. I wouldn’t mind booking another trip to Japan myself. I barely scratched the surface, and then totally fell in love with it. 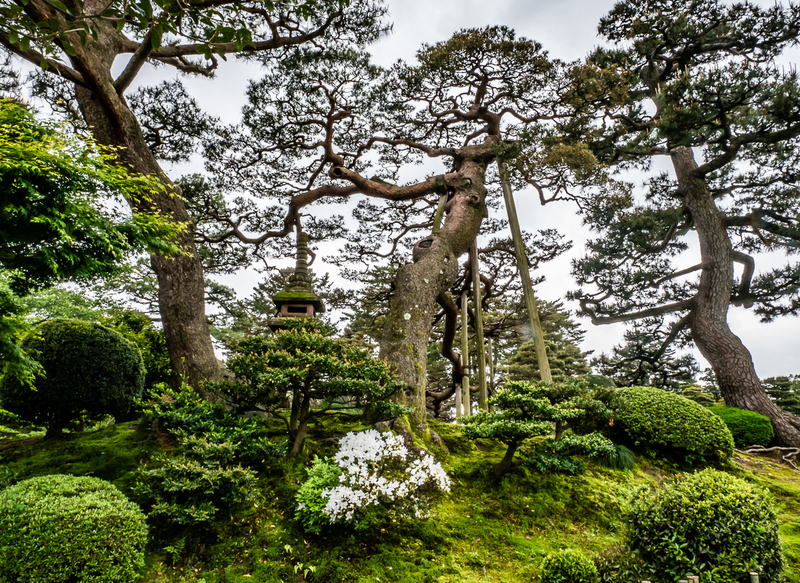 So much there to see and admire – propped up trees, ramen, gold sprinkles, matcha green tea and daifuku. The list goes on. And this was just in one day! I don’t want your Japanese posts to end. They remind me so much of our time there. I cannot get enough of this fabulous country, where so much thought and attention goes into every little thing. I totally agree with you about Japan. What an extraordinary culture it is. Don’t worry – there are plenty of posts to come yet. Great post Alison loved reading them. 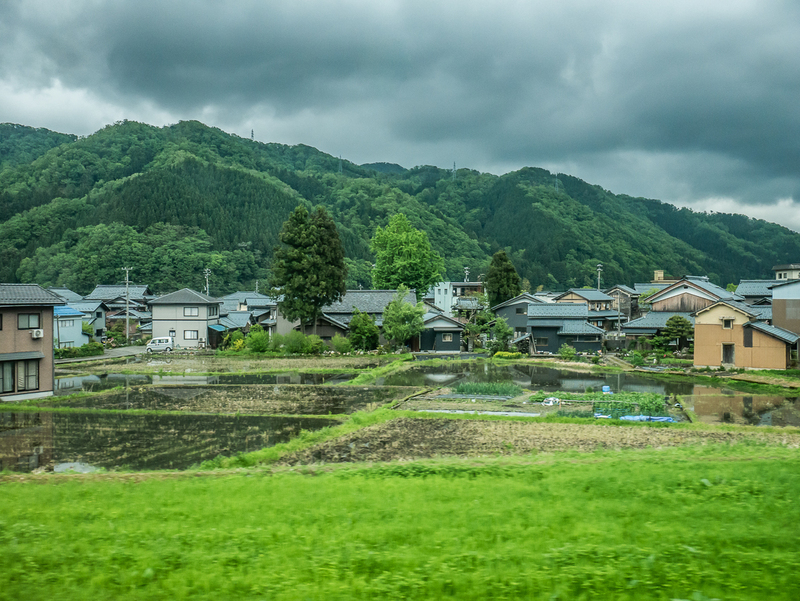 One of the things I found in the blogosphere is that there are very few Japanese travel posts. Probably because of the language barrier. But in any case, you are doing a great job narrating each minute thing in detail. Loved the picture. 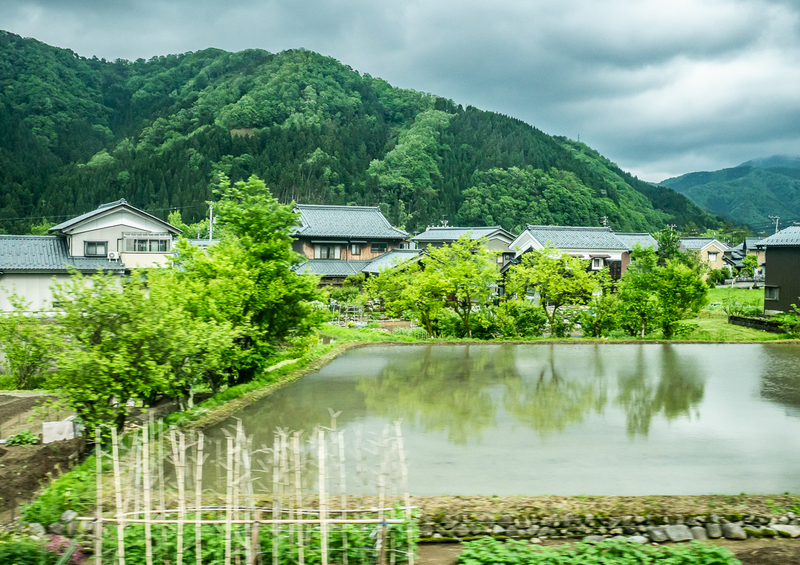 I can see Japanese perfection even in the landscapes! Thank you so much Raj. I don’t know why there are so few posts about Japan. I found quite a few, and travel to Japan is apparently booming so maybe more will come. Japan’s a very industrialized country that hasn’t allowed industrialization to overwhelm the culture which strives for perfection and beauty. It’s a rare combination I think, so perfection and beauty can be seen even in the rural landscapes. Thanks so much Beth. Kenrokuen is such a beautiful place. I’m glad I went there. How beautiful. I’ll hope I’ll be able to visit Japan one day. It really is beautiful. I’m so glad I went there. I hope you get to Japan! Having a local or someone who has been living in our travel destination for quite some time is probably the best way to get to know that place. Not only can we try the best local dishes, but we’re also usually able to see corners most tourists don’t know about. Having Mo to show you around Kanazawa really made a big difference, I believe. 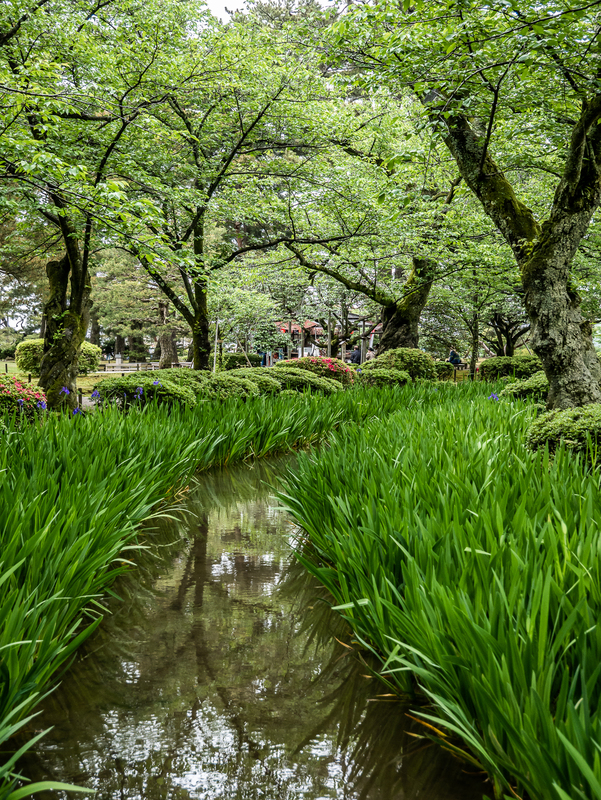 Speaking of the garden, the Japanese do know how to make one that doesn’t look and feel artificial; who else would’ve thought of leaving moss and incorporating it into the overall garden landscape? Having a local is the best thing! It was such a treat to connect with Mo and have her show me around, and yes, I agree it made a huge difference. I wish James had still been in HK when I was there. One of these days I will descend on you both in Jakarta! 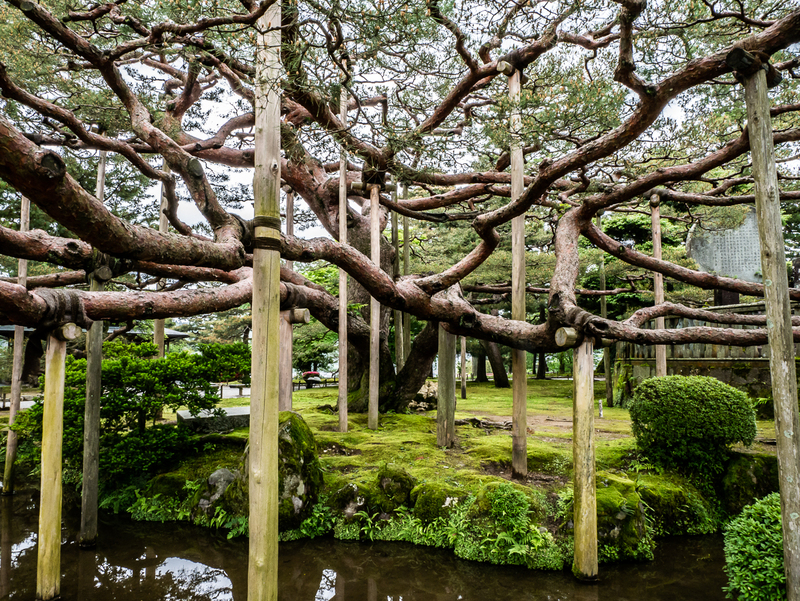 I read about the Japanese incorporating moss into their gardens while researching this post. It is such a beautiful and natural part of the garden landscape that I didn’t even think about it when I was there. I’m really loving these Japan posts! I’ve never really considered Japan before, always caught up in other places I want to go, but it’s deffo on the list now! Thanks Amanda. Japan is Amazing! It was never high on my list either, but I totally fell in love with it and would love to go back and explore more. Love those simple but serene look of Japanese rooms. And their gardens….wow! I feel so peaceful in those rooms. There’s nothing to clutter the mind, and yes their gardens are so beautiful. I’m really glad I went there. The pictures are amazing! Definitely sounds like somewhere i would love to go. Thanks so much. I would definitely recommend it, and also Japan in general. I never expected Japan to be so wonderful. I’d go back in a heart beat. 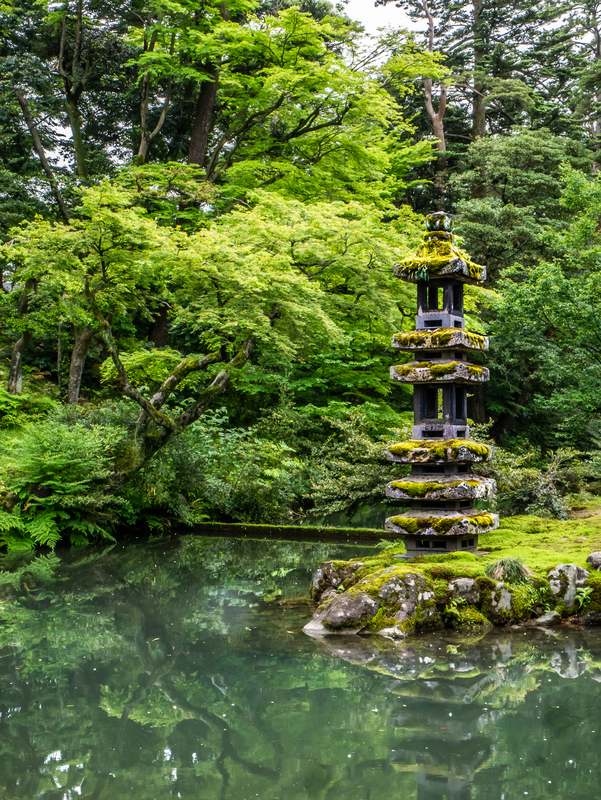 What beautiful gardens…I especially like the moss covered lanterns and the concept and practice of propping trees up. The matcha tea and bean cake looks quite delectable. Japanese sense of aesthetic and design is quite unique! Your blogger “get together” made me smile as it reminded me of the lovely visit we had from adventurer and sailor Lisa of “One ocean at a time”, earlier this year. I love the Japanese aesthetic. It’s so uncluttered, though I doubt I could live with quite that level of minimalism. I tend more towards cosy. But in their gardens! They’ve captured something special – this combination of letting it be natural with carefully tended perfection. 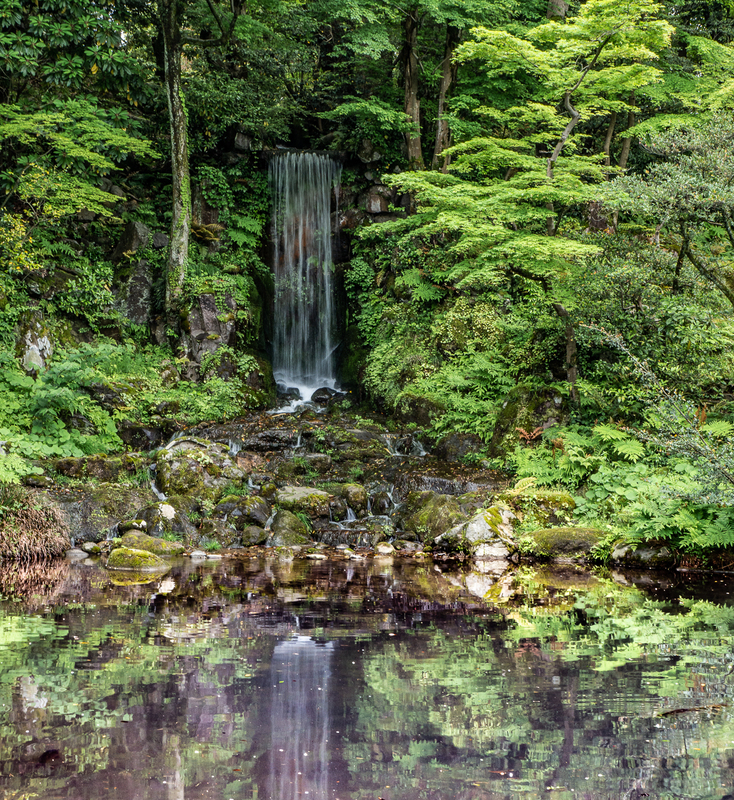 I went to another garden at Nikko which I’ll post about eventually. It was so lovely to get together with Mo. I read about you getting together with Lisa and the Captain, and about Lexie spending a week with them on the boat. I’d love to meet them one day. I see at least a few other people were as in love with the moss-covered lantern as I was! 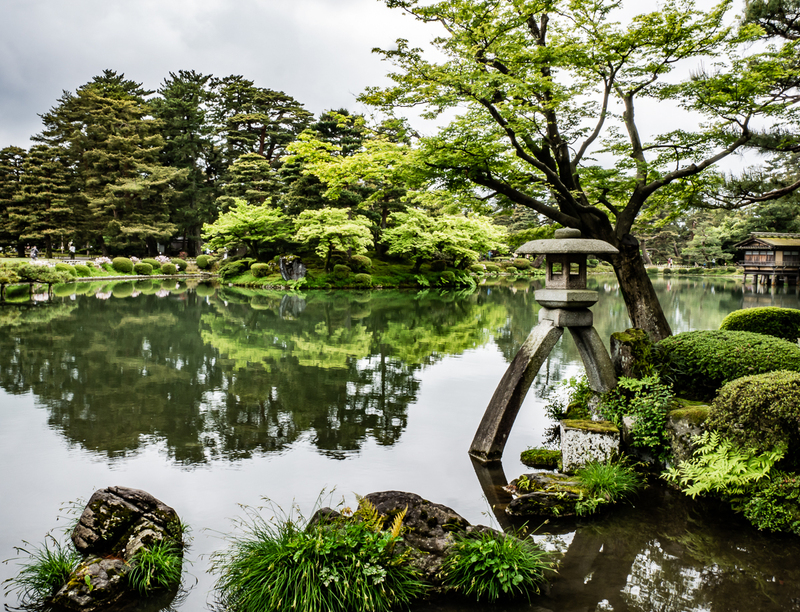 I so admire the Japanese aesthetic – in gardens and other design. It is so simple yet rich. I smiled in recognition when you said you might not have entered the tea place alone; I too get intimidated by places and experiences that are way out of my realm of knowledge. I was so happy to meet a friend of a friend when I was in Seoul; otherwise, I would have been lost in more ways than one. Your travels outside of the big cities are luring me to Japan! Japan is so special Lexie. I really had no idea. The mossy gardens, the aesthetic in everything, the general politeness while still celebrating their ancient culture. It’s culturally so rich. I hope you get there one day. I’m glad I’m not the only one intimidated when things are so very foreign to what I’ve experienced. It was one of the things I both loved, and was bamboozled by in Japan. I can’t imagine, for instance, being too shy or intimidated to enter a tea house/cafe in any SE Asian country or India. And yet once I got inside the tea house it was a really special experience. Lovely post and yes, that looked like a very filling bowl of ramen. Tree propping for shapely growth is rather interesting. One of my sisters who did her undergraduate degree in biology thought bonsai (which this is not), was inherently cruel to the plant. Twisting it to meet man’s aesthetic needs rather for natural growth of plant. Thank you. It’s a very amazing place. Thanks Lynn. That green really did seem to shriek at me – nothing ever quite beats a spring green in the garden. 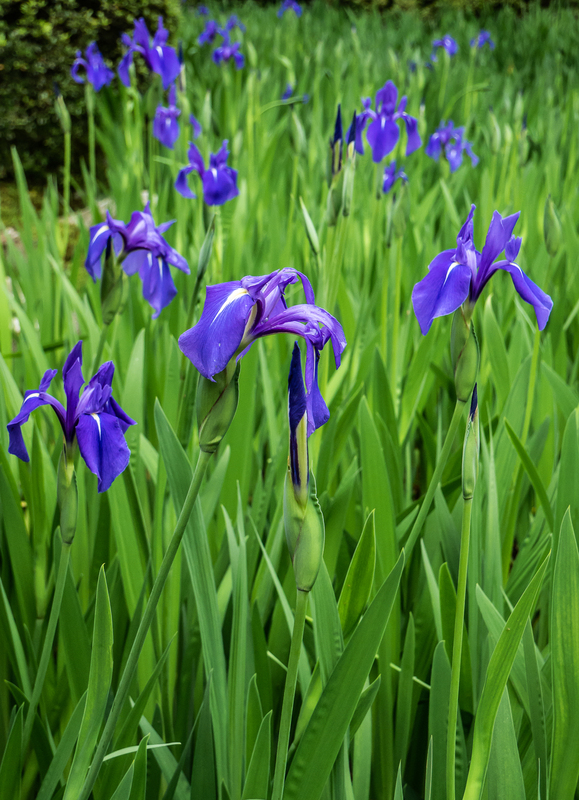 The whole garden was beautiful, and coming upon those irises a sweet surprise. Venerable is the perfect word for those trees! Wow your photos are absolutely stunning Alison and how fun to meet Mo in person! Looks like a wonderful visit. Thanks so much Nicole. It was great to finally meet Mo in person! It was a wonderful visit. I’d love it if we could meet IRL one day! Kenrokuen is definitely worth a visit. There’s a castle in Kanazawa too, though I didn’t see it. Have you been to Japan before? It was my first trip and I was completely captivated and would love to go back. Yes, I’ve been a few times for work and pleasure – in fact, Japan was my first trip outside Europe! But I’d love to return nonetheless! How wonderful that you and Mo could meet and have the time together. Not to mention that she remembered the area your locker was! It has been one of the greatest joys of blogging is the making of new friends. When the opportunity presents to meet in person it is a true gift. I hope we shall cross paths one day soon. It was so much fun to get together with Mo and be introduced a little bit to the Japanese way. It sounds like a reasonable plan. We are headed to Mexico in November so it likely won’t be this fall sadly. It’s so strange yet pleasant to read about myself in your blog! Again, it was a lovely day and a lovely meeting. You have really captured Kanazawa well with your words and pictures. Thanks Mo. 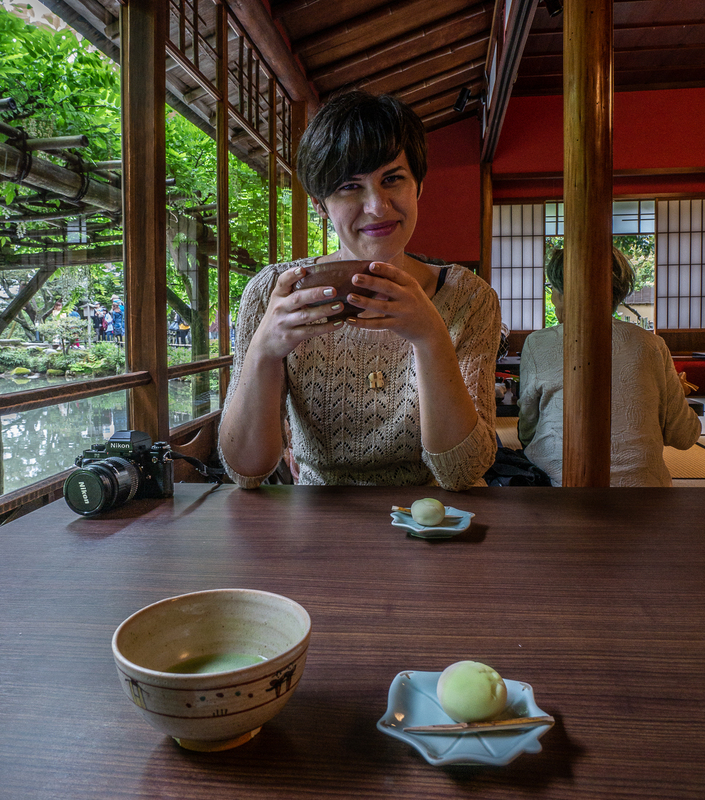 I loved the tea house, and the garden, and especially the ramen (! ), and it was so nice to meet you finally. Maybe you’ll make it to Vancouver one day. Enchanting garden! One can sense the serenity all around. Oh sidran you are right! It was absolutely enchanting, and very serene. Such a beautiful place. How lovely it is to be transported tonight–into friendship, into the fourth sublime and complimentary pairing every garden requires (your words and your images), into beauty. I’ve missed visiting here and witnessing the majestic scenes you offer, Alison! How wonderful that you met a blogging friend and in such a special place. It is always a treat to be with someone familiar with the place, food and customs. That meal looked so good! The pictures are awesome! Thanks so much Darlene. It was really wonderful to meet Mo, and to have a “local” to show me around. And I don’t think I’ll ever forget that meal! One of the best ever. 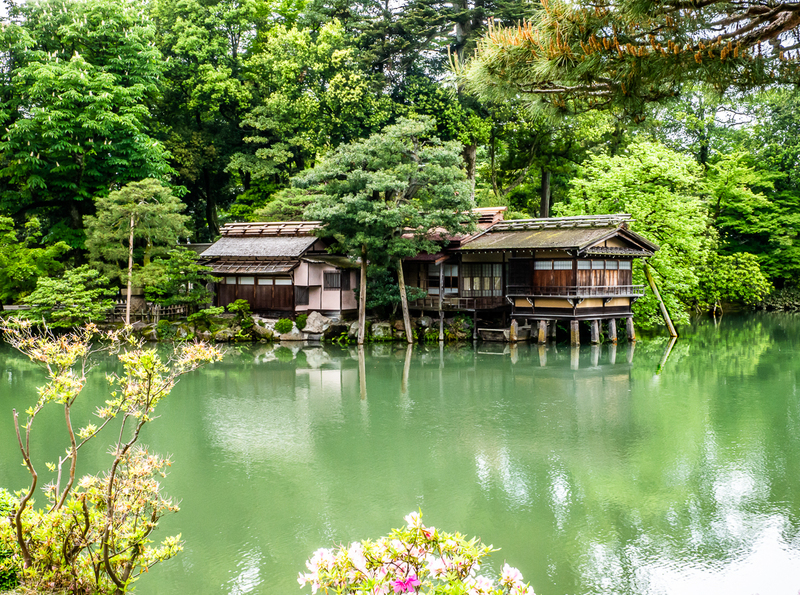 The Japanese aesthetic, whether the architecture, gardens, food presentation is simply exquisite and you have captured it so beautifully in this post. I want to go!!!!! Very cool that you were able to spend time with a blogging friend in such a beautiful place. Thanks so much Caroline. I love the Japanese aesthetic – so simple and elegant – and it seems to say so much about who they are as a people. And it was so good to meet Mo and have her show me around. Go to Japan! It’s amazing! What a wonderful post and what a delight to meet a fellow blogger, a lovely woman who became your personal tour guide. Loving nature as I do, I am so enthralled with every single place you are showing us Alison. Your photos are so beautiful and the care that the Japanese give to everything around them is evident and like a magnificent love story. Can’t wait for the next post! Thanks so much LuAnn. Meeting Mo, and seeing Kenrokuen was just lovely. I loved Japan, and their kindness and respect for others and for nature was a big part of it. I like your idea of it being a magnificent love story – at times it felt like that. I’d love to go back.